On March 17, 2017, Michelle Stirling presented “The Myth of the 97% Consensus” to the FreedomTalk.ca Annual Conference in Calgary, Alberta. In her talk, she deconstructs a number of the most cited consensus surveys and explains why there is no 97% consensus, why this figure is repeatedly used as ‘statisticulation’ and what the Asch Conformity Experiment is all about in relation to the consensus claim. Science is actually a rough and tumble sport. The person that gets the science right first gets the credit for the science. Someone that is able to upset the apple cart and be right wins. Yet there is the implication that the scientists are a bunch of yes men and women. Seems contrary to the charachter of science. The winners in science are anything but what Mrs. Stirling is claiming. Since 2007, when the American Association of Petroleum Geologists released a revised statement, no scientific body of national or international scientists rejects the findings of human-induced effects on climate change. Sooooo the IPCC in its two years of review of the world’s climate science, are cowtowing and intimidated in speaking up. It is a review to see the validity of the science and how it comes together in all its myriad of pieces. All the science fields are quite frank in talking about their fields of study. Climate is no different. IF 97% of scientists agreed…was that science? Or compliance? And …why? Why 97%? There are many different numbers in the actual studies and 97% has come up more than once. I think Mrs. Stirling understands there are many different studies coming up with different conclusions, so this is really her own little charade dealing with the public conversation. This is more to stir confusion than to educate the public on the true discourse of climate science. Where are all of these studies? Are you just parrotting the made up statistic without requiring any proof? Regardless of any consensus that may (or may not) exist, science is about proving the theory with repeatable tests. You may believe the theory, but it is not science, and no amount of voting will change that. What a heap of totally discredited garbage. renewableguy, has anyone ever told you that you haven’t the first idea what you’re wittering about? You are the very first. Care to have a conversation or are you just going to sit on the sidelines in the peanut gallery? It would be more productive to debate the virgin birth with an Evangelical Christian or Evolution with a Creationist than to attempt to debate with anyone who truly believes the 97% BS, which has been debunked so many times it is a totally defunct issue. Ok Catty. I see that you are really pouty here. Guess you can’t handle it. You silly attention-seeking child, you just don’t get it, do you? I think it probable that around 99.9999% of scientists in all disciplines and the vast majority of the population at large are utterly confident of the reality of climate change, and that the climate has been changing since the planet developed an atmosphere and will continue to change until it loses it. I can look out of my window and see the effect on the terrain of the glaciers that covered the land only a few thousand years ago. That was some climate change that melted around a mile thick ice sheet – and did so with no anthropogenic assistance whatsoever. So the 97% BS is just that, pure BS with no grounding in reality whatsoever. As to anthropogenic climate change AKA AGW, it is becoming increasingly obvious from the latest research that mankind can no more significantly influence the climate on a Global – as opposed to local, such as urban heat island or certain agricultural operations – than significantly alter the time the sun rises and sets. For one thing, th critically important correlation between atmospheric water vapour and CO2 has been shown by the NASA NVAP satellite data not to be occurring, and without the positive feedback resulting from that, the increase in CO2 alone is incapable of causing a sufficient rise in temperature to be of concern, as is indicated by the decrease in the estimates for the critically important parameter ‘Climate Sensitivity’, the increase in temperature caused by a doubling of the atmospheric CO2 concentration. It is interesting to conjecture from that graph where the ECS and TCR trends are going to be in 2020, 2025 at the latest. Oh, you CAN read and interpret graphs, right? So take your patronising, condescending scientifically uninformed and illiterate drivel, stick it where the Sun don’t shine, and read some up-to-date scientific research papers, there are few fields outside microelectronics that are changing as rapidly as climate science. See that little orange bit at the end? That’s your “unreliables”, hardly taking over the World, are they? Note also that China – the World’s largest energy user, has now started to ramp up its consumption of fossil fuels and restrict the commissioning of new non-synchronous energy sources (wind and solar) because of their destabilising effect on the distribution grid. You evangelical AGW lot are so totally twentieth century, it’s over. So now perhaps you can devote your energies to something useful, such as spending the billions – trillions even – that are being wasted on the AGW BS on supplying clean drinking water and cooking and lighting facilities to the billions of citizens of the Third World, who are suffering and dying in far greater numbers from a lack of such facilities than they ever will from an increase of the odd degree in temperature. In conclusion, perhaps this research from NASA/NOAA on increased global greening as a result of increased CO2 and temperature – an unmitigated benefit – might give you cause for thought. But I doubt it. Note that it is in the highly reputable publication ‘Nature’, not some crackpot alarmist propaganda blog like skepticalscience or a fake news rag like ‘the Guardian or the ‘Puffington Host’. I don’t understand why you would make such a bogus statement there Cat. Care to take your statement back? It is simply wrong. This is the backbone of anthropogenic climate change. CO2 heats up the earth and water, water vapor increases. 70% water surface is hard to get around. 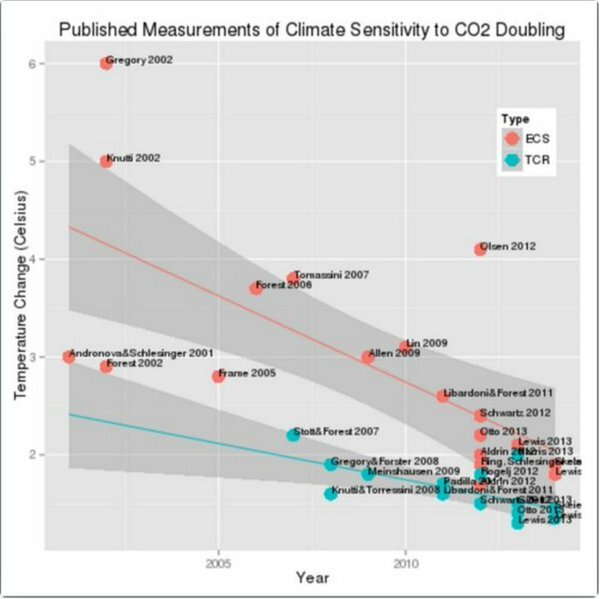 the increase in CO2 alone is incapable of causing a sufficient rise in temperature to be of concern, as is indicated by the decrease in the estimates for the critically important parameter ‘Climate Sensitivity’, the increase in temperature caused by a doubling of the atmospheric CO2 concentration. So you are saying that, 1*C warming from co2 alone is insignificant. Is that correct? 3*C increase from 1*C co2 seems pretty potent to me. Could be as high as 4.5*C.
CO2 climate sensitivity has a component directly due to radiative forcing by CO2, and a further contribution arising from climate feedbacks, both positive and negative. “Without any feedbacks, a doubling of CO2 (which amounts to a forcing of 3.7 W/m2) would result in 1 °C global warming, which is easy to calculate and is undisputed. Rahmstorf, Stefan (2008). “Anthropogenic Climate Change: Revisiting the Facts”. In Zedillo, E. Global Warming: Looking Beyond Kyoto (PDF). Brookings Institution Press. pp. 34–53. Frequency distribution of climate sensitivity, based on model simulations. Few of the simulations result in less than 2 °C of warming—near the low end of estimates by the Intergovernmental Panel on Climate Change (IPCC). Some simulations result in significantly more than the 4 °C, which is at the high end of the IPCC estimates. This pattern (statisticians call it a “right-skewed distribution”) suggests that if carbon dioxide concentrations double, the probability of very large increases in temperature is greater than the probability of very small increases. It is a model, but represents possibilities of the future with a doubling of co2. CO2 has the possibility of being very potent. There is more in there should you care to read. Idso is in there with a predictable very low climate sensitivity. Being that he is publicly skeptical. That is also very biased in how he chooses to interpret science. Based on analysis of uncertainties in total forcing, in Antarctic cooling, and in the ratio of global to Antarctic cooling of the last glacial maximum relative to the present, Ganopolski and Schneider von Deimling (2008) infer a range of 1.3 to 6.8 °C for climate sensitivity determined by this approach. Forest, et al. (2002) using patterns of change and the MIT EMIC estimated a 95% confidence interval of 1.4–7.7 °C for the climate sensitivity, and a 30% probability that sensitivity was outside the 1.5 to 4.5 °C range. Anger and agenda go together. Anger is used to shut down commen sense because it is what works if you have an agenda. I would guess An Inconvenient Truth worked for reasons of money, fame(Nobel Prize), politics, an agenda that had nothing to do with saving the world. Biggest scam of this centuary.